Neighborhood Nights On Thorndale Start In June Reviewed by Edgeville Buzz on May 21, 2009 . 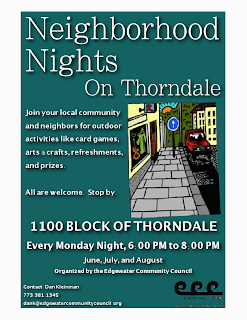 Just in time for summer, the Edgewater Community Council will begin hosting Neighborhood Nights on Thorndale. Since the positive loitering event at Thorndale and Broadway on May 11th, the ECC has been hard at work on developing a recurring proactive event for that particular area. We’d like to express our support for this new initiative, and hope that many of you are able to attend!